OAKLAND, Calif., Dec. 19, 2017 /PRNewswire-USNewswire/ -- The Department of Industrial Relations (DIR) reports that 376 Californians died on the job in 2016, down slightly from the 388 deaths in 2015. "Even one workplace fatality is too many, and our thoughts are with the families of those that died on the job last year," said Christine Baker, DIR Director. "The fatality data released today is a reminder that we must all continue our efforts to reduce workplace safety and health hazards in order to prevent worker deaths." 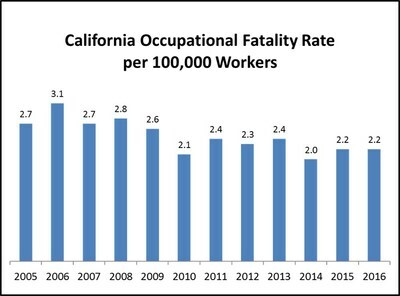 A review of the past twelve years indicates that workplace fatalities in California remain below the average rate of fatalities prior to 2008, when the last recession began, and remained flat over the past two years at 2.2 deaths per 100,000 workers. On the national level, the rate of fatalities jumped from 3.4 to 3.6 per 100,000 workers. There were 376 fatal injuries on the job in California in 2016, compared to 388 in 2015, 344 in 2014, and 396 in 2013. 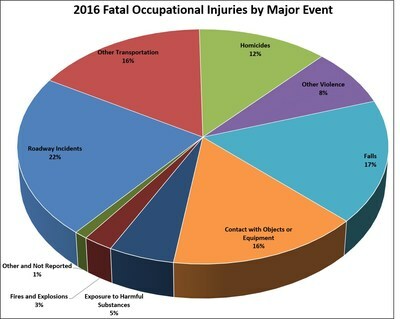 Data comes from the Census of Fatal Occupational Injuries (CFOI), which is conducted annually in conjunction with the U.S. Bureau of Labor Statistics (BLS). Figures for 2016 are the latest numbers available. One in five (20%) of all California workplace deaths identified in 2016 were attributed to violence and other injuries by persons or animals. The incidence of workplace homicides in 2016 accounts for 12% of all workplace deaths in the state. Nearly two of every five (38%) California workplace deaths identified in 2016 occurred in transportation incidents. One in six (17%) of all California workplace deaths identified in 2016 were attributed to trips, slips and falls; with 90% of those deaths involving falls to a lower level. 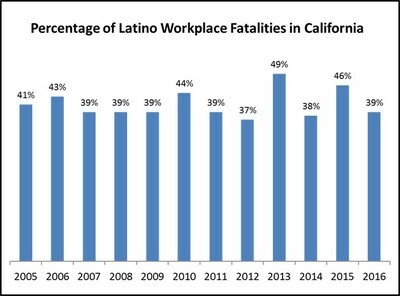 Nearly two of every five (39%) California workplace deaths in 2016 were Latinos. This fatality rate has fluctuated over the past ten years from 37% to 49%. The percentage of Latino deaths in the workplace continues to be an area the department is tracking closely. DIR over the past eight years has increased workplace safety outreach and education to Spanish-speaking workers, with a focus on high-hazard work. 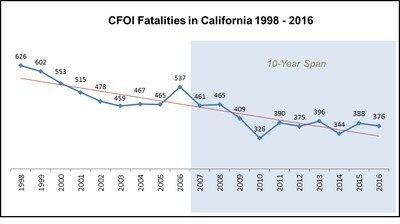 Tables reflecting final data for 2016 (and prior years' final data) for California are posted online, as well as a report reflecting four years' of fatal occupational injuries in California. DIR protects and improves the health, safety and economic well-being of over 18 million wage earners, and helps their employers comply with state labor laws. Its Division of Occupational Safety and Health, commonly known as Cal/OSHA, helps protect workers from health and safety hazards on the job in almost every workplace in California. Cal/OSHA does not have authority when injuries occur on public roadways where other state or federal agencies have jurisdiction, such as the California Highway Patrol. Cal/OSHA's Consultation Services Branch provides free and voluntary assistance to employers to improve their safety and health programs. Employers should call (800) 963-9424 for assistance from Cal/OSHA Consultation Services. Cal/OSHA has also published a wealth of helpful guides for employers and workers. Members of the press may contact Erika Monterroza or Peter Melton at (510) 286-1161, and are encouraged to subscribe to get email alerts on DIR's press releases or other departmental updates. Graph 1 - Current Population Survey, BLS Labor Force Data (Employment as of July of calendar year), and Census of Fatal Occupational Injuries (annual final data for calendar year). Graph 2 - Census of Fatal Occupational Injuries (annual final data for calendar year). Graph 3 – 2016 Fatal Occupational Injuries in California by Major Event, Census of Fatal Occupational Injuries 2016. Graph 4 – Percentage of Latino Workplace Fatalities in California, Census of Fatal Occupational Injuries (annual final data for calendar year, table A-7: percentage of Hispanic or Latino fatalities as compared to all fatalities). For further detail on CFOI methods and calculations see Part III: Census of Fatal Occupational Injuries.